Tea party organizer Kim Simac has won a Republican primary in a Wisconsin recall election, and now advances to challenge Democratic state Sen. Jim Holperin next month. Simac had 59 percent of Tuesday's vote with all of precincts reporting, in unofficial returns. She defeated Bob Lussow, a retired airline pilot and the current chairman of the Lincoln County Board. The recall effort followed Republican Gov. Scott Walker's divisive plan taking away collective-bargaining rights from most public workers. Six Republican state senators face recall elections next month for supporting the plan. Holperin and two Democratic colleagues were targeted for fleeing the state to stall it. Holperin and Simac will now square off in a general election Aug. 16. 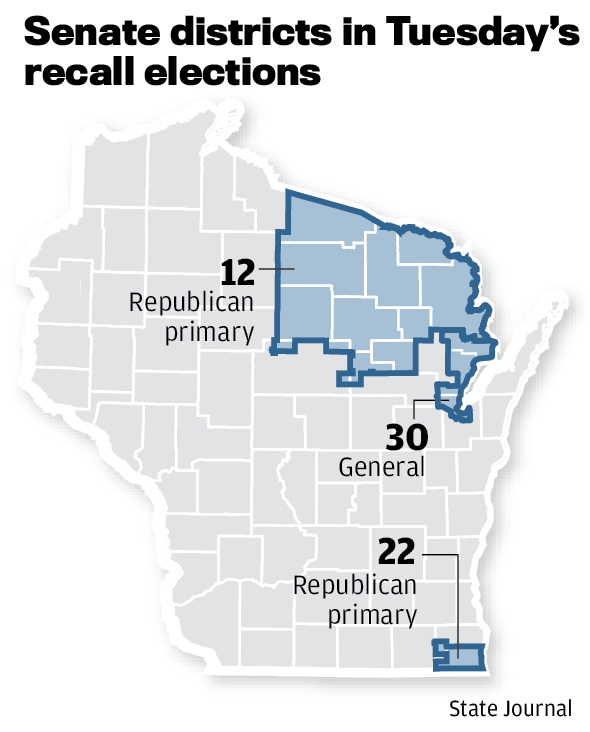 The race is for the seat in the 12th District, which covers northern Wisconsin. A Wisconsin state senator survived a recall election Tuesday that gave voters the most direct opportunity yet to react to a Republican-backed law that stripped most public workers of their collective bargaining rights.